But I’m not one to quit after 3 words, so I’ll ramble on for 3 more paragraphs. The wife and I are Scrabble fans, but two things prevent us from playing this time of year. First, we usually have to sit at the kitchen table to play. The kitchen table is fine for enjoying Chicken Tikka Masala, but I’m not a fan of sitting there to play games. Second, our house is cold… really cold… and in the evening the warmest place is in bed, under the electric blanket, so being able to play Scrabble in the comfort of a nice warm bed is ideal. 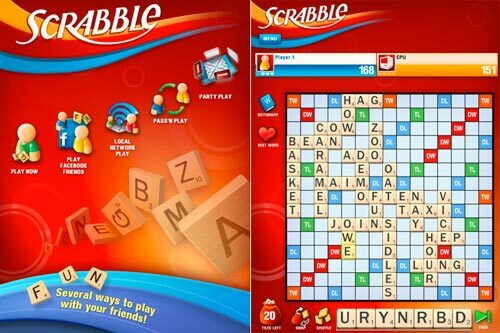 You play Scrabble on the iPad by taking your turn and then passing the iPad to the other player for their turn. But Scrabble on the iPad isn’t just limited to playing in bed. You could probably also play on the couch, at the park, in the car, or anywhere else a Scrabble board won’t easily go, like the International Space Station. When Scrabble for the iPad first came out (which was long before I had an iPad) I joked that I could convince my wife the iPad was the greatest invention ever because you could play Scrabble on it… I’m still working on convincing her, but I think I’m getting closer. Posted on Friday, January 28th, 2011 at 8:00 am. Subscribe to the comments feed. Both comments and pings are currently closed. Post on your own blog.